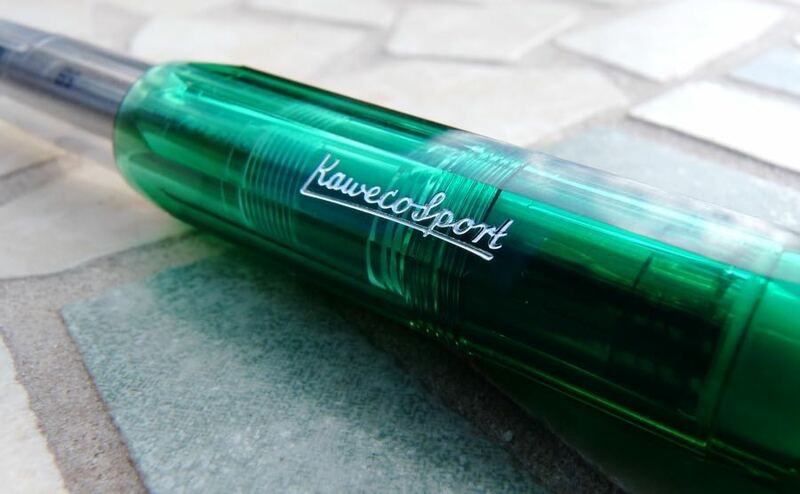 Kaweco Ice Sport Rollerball Review and Giveaway – Pens! Paper! Pencils! The Kaweco Ice Sport Rollerball is a refillable pocketable liquid ink pen that’s available in a wide range of colours. It’s a variation on the Classic Sport range, featuring a clear barrel and translucent cap and grip. 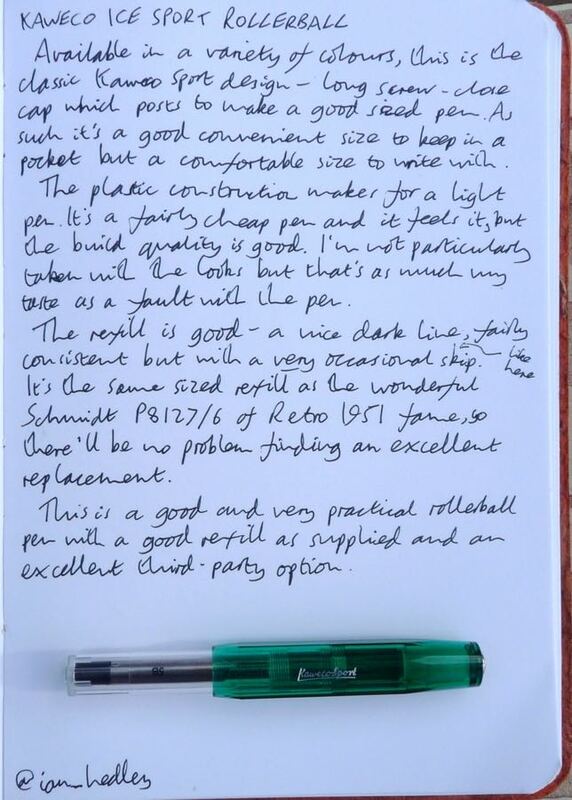 This one was sent to me by Kaweco free of charge for review purposes. 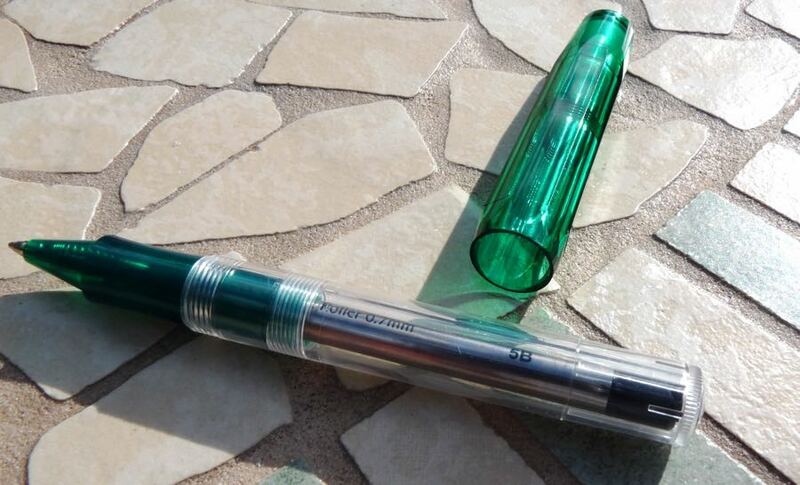 As I’ve said many times when talking about the Sport fountain pen range, this is a classic design. 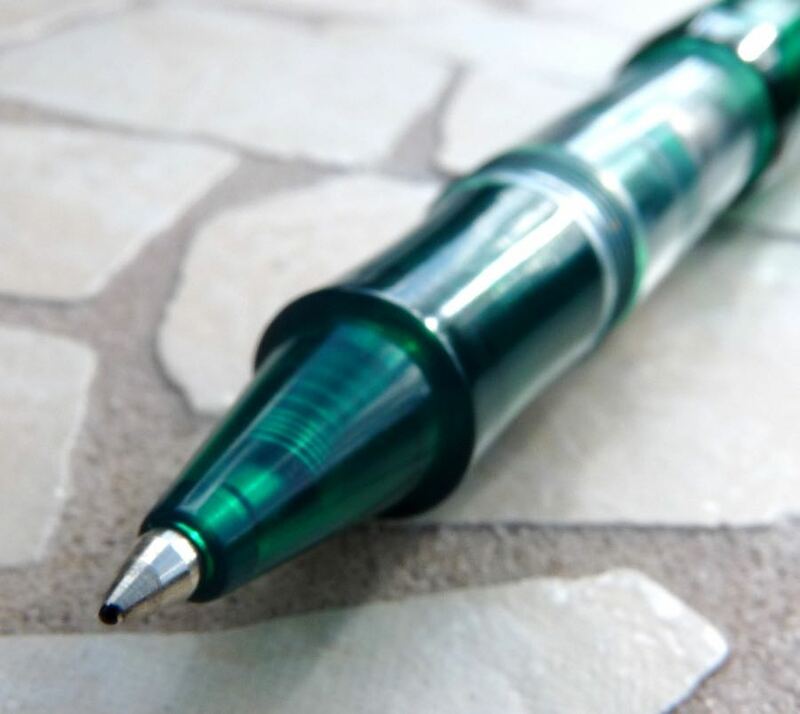 The oversized cap makes for a pen that sits in the pocket comfortably but extends the pen, when posted, to a good size for writing. In most forms, Sports look fantastic but this particular configuration doesn’t quite do it for me. The refill is pretty good. It’s a good dark line and mostly consistent. There’s a very occasional small skip: not something you’d notice if you weren’t looking but nevertheless there. This pen takes the Retro 1951 (Schmidt P8126/P8127) refill, though, which means you can use one of the finest rollerball refills there is. 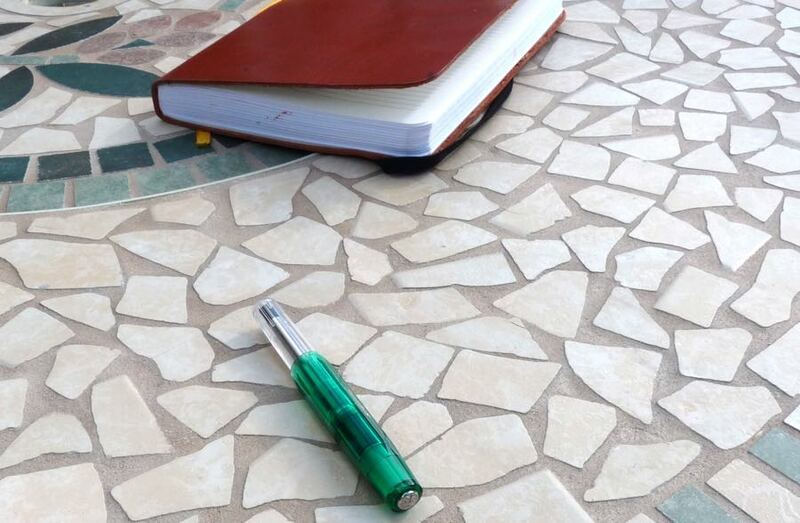 In use the pen is very light, due to the plastic construction, but a good length and so comfortable overall. 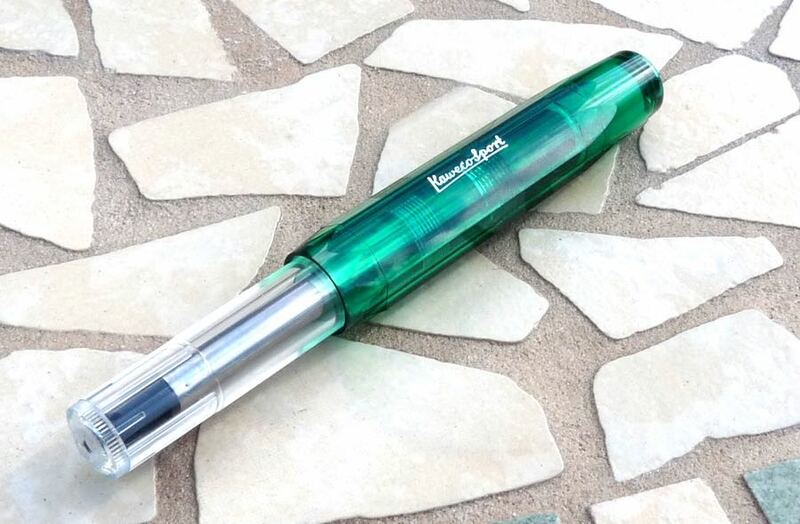 The Kaweco Ice Sport Rollerball is a good little rollerball pen that can use a fantastic third-party refill. The design doesn’t quite do it for me, as I said, and so I’m giving this one away. Say thank you to someone you know in the comments. I’ll pick one lucky reader using random.org and send you this pen. The giveaway ends at 9am GMT on Sunday 11th October. You can only enter once. Many thanks to Kaweco for sending me this pen to review. These are my own opinions. A good choice to keep in a jacket or the car. I’d say thank you to my partner for all the bottomless support <3. I love the demonstrator opaque body on this. Thanks for a great competition! I’d like to say thanks to my friend L who has been there for me, through good times and bad! I’d like to say thank you to my daughter (8 years old) who allowed me, yesterday, explaining with two balls and the luster of the kitchen the moon total eclipse (resulting in blood moon) we were about to see. Then together, out on the balcony, looking at the moon and the stars with binoculars, was a special moment. Thanks to my brother and sister for maintaining a wonderful relationship among the three of us all these years. I don’t know any siblings who all appreciate and support each other the way we do. Thank you to James O’Leary for many years of friendship. Thanks for the opportunity to win, and to my wife for being patient with me when life has me stressed out. Thanks for the chance to win and my wallet for being so open to my habit. Thanks to my parents, for working so hard in spite of anything. Also thanks for the giveaway! This pen looks lovely. Thanks to the lady at a car boot sale at the weekend who sold me two-thirds of a Waterman Lady Anastasia fountain pen for 20 cents. The nib is lovely… the cap is sweet with its little transfer picture… now all I need is a barrel! Thank you so much to my wife and kids, who make my life worth living. I want to say thank you to my soccer coaches, who take time out of their days to make my team’s better! Thank you Raju for inspiration daily. Thank you you to my family.. I’ll write them letters if I win this. Thank you to my wife Debbie for allowing me to indulge my pen, stationery, and office products mania! I’d like to thank my mother for giving me everything when I needed it. And thank you for this chance to win a cool pen! Thank You for doing this Ian. Very cool idea. Thanks to you for sponsoring this giveaway!